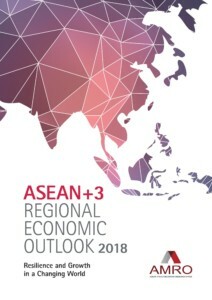 The ASEAN+3 Regional Economic Outlook (AREO) provides a comprehensive assessment of recent developments and the outlook for the regional economy, taking into account spillovers from the global economy and inter-linkages in financial markets. The first part on ASEAN+3 Macroeconomic Prospects and Challenges contains AMRO’s regional outlook assessment and regional growth projections at 5.4% in 2018 and 5.2% in 2019. This section also includes AMRO’s Global Risk Map, while summarises the risks faced by the region. An assessment of each economy’s position in the business and credit cycles supports the policy recommendations discussed in this section. The thematic study, Resilience and Growth in a Changing World examines the continued relevance of the “manufacturing for exports” strategy that have been adopted by ASEAN+3 economies over the last few decades, and how this strategy can be augmented with the challenges posed by changes in global value chains, technology and the rise of the services sector. It includes recommendations on how the region as a whole can strengthen intra-regional connectivity and integration as well as build its resilience against external shocks.